Thanks to MILES, the ULTIMATES are back! 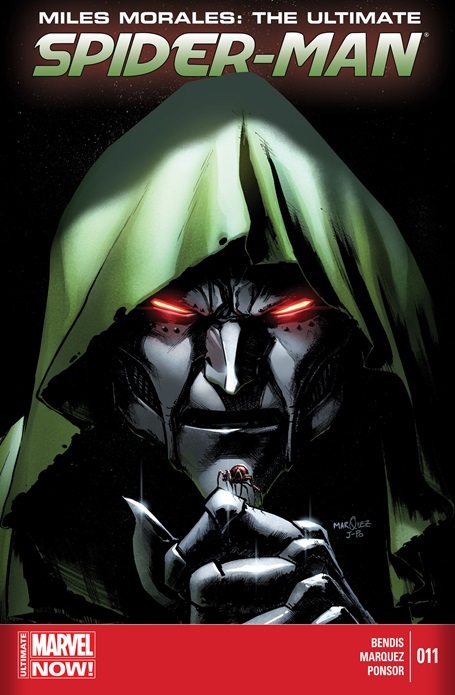 Because DOCTOR DOOM has revealed his plan and it is more than one web slinger can handle! At a S.H.I.E.L.D warehouse the Chameleon twins are trying to retrieve an artefact. They battle Peter Parker’s female clone and take her as well. Katie tries to reason with Miles in the hope that they can work together. Miles breaks out but her father calms him down with video footage of his father and best friend held hostage. Victor Van Dame arrives backed by Doombots and the Chameleon twins. This month Victor Van Dame graces our cover with ominous glowing red eyes and an overall creepy vibe. This is an awesome cover! David Marquez continues stellar work on the art of this book. Emotive and captivating eyes, fluid and seamless choreographed fight scenes and layered colors. This is my top book each and every month since it debuted and it continues to hold my heart. Brian Michael Bendis is not overrated and neither of Miles Morales both comes together each month in a perfect symbiosis of pure perfection. Get this book! So next month is the last issue of this run before Secret Wars and the merger of universes. I’m sad to know its ending but we already know Miles Morales survives. Miles Morales- New Details revealed!! !